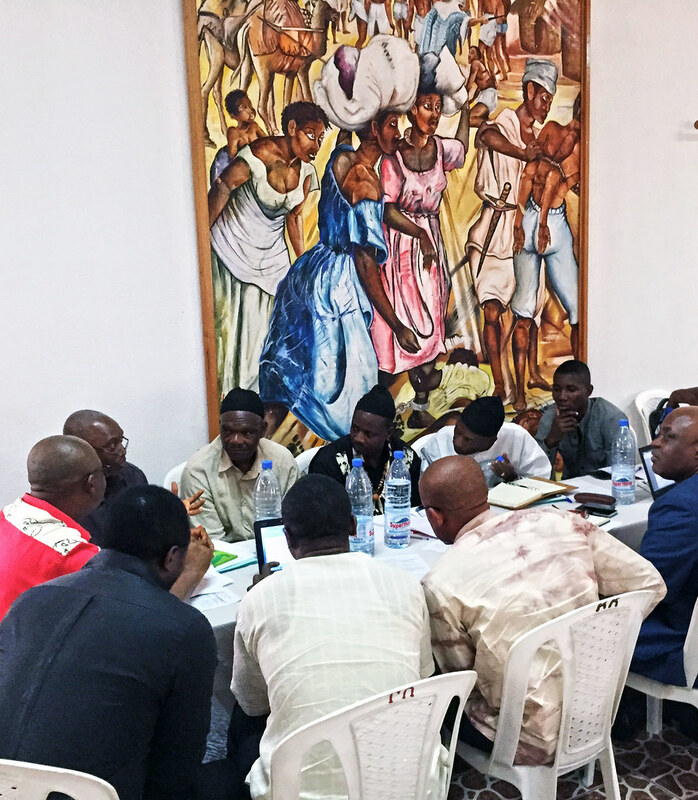 The EU REDD Facility is working with a multistakeholder coalition to bring more transparency to land-use planning and land-allocation processes in Cameroon. The Facility and its partners have developed a tool called the Common Mapping Platform that enables stakeholders to access social, environmental and geographical data for making informed land-use planning decisions. Partners include representatives of government and civil society, as well as mapping specialists. The EU REDD Facility’s objective is to design, build and test an interactive mapping tool that will help foster inclusive, coordinated forest management and land-use governance. The project team works directly with stakeholders to develop a tool that meets their needs in making land-use decisions. In parallel, the project team provides technical advice and tools to implement the Land-Use Planning law introduced in 2011 by the Cameroon Ministry of Economy, Planning and Regional Development (MINEPAT). The project is operating at the micro level in the municipality of Nguti with an end goal to scale up this model and implement it in other municipalities and at the regional level. In recent years, deforestation in Cameroon has increased, driven by the expansion of agro-industry, slash-and-burn agriculture, logging, demand for fuelwood, mining and the development of infrastructure. Most recently, the allocation of large land reserves for agricultural use, such as for palm oil plantations, has created tension among stakeholders. The perception that the process of land-use planning lacks consultation and the involvement of local communities threatens to create conflict and controversy around forest conversion. In 2011, the Cameroonian government took steps to develop a land-use planning law in order to manage land use more sustainably. So far, there is limited experience in Cameroon or the wider region in drafting land-use plans that reconcile the various interests of stakeholders in a balanced, informed and participatory way. The data used to guide land-use planning decisions are managed by different institutions and are often incomplete or out of date. Reliable and accessible data to inform land-use management is often lacking, especially at the micro level where communities are directly affected. The challenge is to design, build and test a tool that all stakeholders can use, that helps them share information and achieve consensus on land-management decisions. The Facility selected Nguti Municipality in southwestern Cameroon for piloting participatory mapping. The municipality has experienced conflict over land-use and there is a risk of conflict in the future. The expansion of agriculture and development of infrastructure are putting pressure on the forest. Stakeholders were willing to participate. As a first step in developing an interactive mapping tool, the project team, led by LTS International, Rainbow Environment Consult and AJESH, gathered input from a wide range of direct stakeholders, including local government administrators, community groups and the private sector. The project team consulted local stakeholders to understand which decisions are made during land-use planning at the municipality level, what information stakeholders need to guide such decision-making, and how land-use planning at the local level should be conducted. Guided by the information gathered from the consultations in 2015, project partners collected spatial data. Wherever possible, partners worked with institutions and experts to make use of existing data and to avoid redundancy. The Facility formed alliances with government ministries, international and national NGOs, international research institutions and project implementers working on the ground. The project has evolved into a voluntary initiative of partner organisations, which plans to build upon and expand the work. The Facility partnered with the World Resources Institute (WRI) to develop a beta version of the mapping tool, and continue to support and maintain the mapping interface in the future. The mapping platform will be hosted by MINEPAT. The information provided through the Common Mapping Platform includes data on: the legal status of designated land and its purpose; land cover, including urban areas, cropland, forests and fallow; the quality of forests, including carbon stocks and biodiversity; transport infrastructure and access to markets; how communities use land and understand their own customary tenure; and the suitability of land for growing cocoa and palm oil. To complement the mapping tool, the project team developed the Land-use Planner, a cost-benefit analysis tool. The Land-use Planner enables stakeholders to create land-use scenarios for their locality, and to identify opportunities and to consider potential conflicts presented by different scenarios. The project partners developed a beta version of the Common Mapping Platform with input from local civil society groups, government and the private sector. The tool was presented at a national workshop attended by local and national government representatives, community chiefs, and national and international NGOs in Buea on 25 February 2016. The Common Mapping Platform presents maps showing areas suitable for cocoa and palm oil plantations, community maps of 35 of the 55 villages in the Nguti Municipality, an accessibility map covering the South West Region to Douala, and a map showing areas of high conservation value. The Common Mapping Platform is fostering the emergence of a coalition of actors with interests in land-use planning. Discussions are underway on a multi-partner programme to continue gathering spatial data and building tools to support participatory land-use planning. The proposed programme will demonstrate the benefits of transparent, inclusive land-use planning processes at national, regional and local levels. Partners, including local, national and international NGOs, have proposed how they could contribute to the Common Mapping Platform going forward. Proposals include helping to share data, helping to build capacity at local and administrative levels to use the Platform, and developing methods for land-use planning at the local level. The Facility developed the Land-use Planner, a cost-benefit tool to inform land-use planning decisions. The tool builds on the Facility’s work to assess the costs and benefits of deforestation-free supply chains in Côte d’Ivoire and can be applied to inform land-use decision-making in other jurisdictions. The Common Mapping Platform provides stakeholders in land-use processes in Cameroon with access to information. Stakeholders include councils, communities, and NGOs at the local level, as well as agricultural companies and administrative departments at the local, regional and national levels. The project has brought stakeholder groups together in constructive, non-adversarial discussions on land-use planning at the municipal level. The Common Mapping Platform integrates data on customary rights and local land use by communities in formal land-use planning processes. Led by traditional chiefs, local stakeholders in Nguti Municipality have expressed a desire to begin formal local land-use planning. This could lead to the first local land-use plan developed in Cameroon in the context of the 2011 Land-Use Planning law. Cameroon is also moving ahead with the implementation of the Land-Use Planning law at national and regional levels. Project partners aim to demonstrate the feasibility of participatory land-use planning in Nguti. Should the participatory model prove feasible, project partners aim to expand it to other municipalities that are under pressure from the expansion of agribusiness and to upscale the model at the regional level. If successful, the Common Mapping Platform will be fully developed and transferred to a Cameroonian government institution.